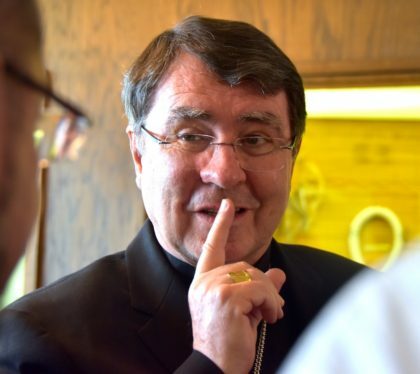 The symposium, which brought in theological and philosophical experts from around the world, was, in part, the brainchild of Archbishop Christophe Pierre, Apostolic Nuncio to the United States. It was during the archbishop’s visit to Sacred Heart last year for the Dehon Lecture that the idea for a symposium on Pope Francis began to take shape. Speakers included Dr. Austen Ivereigh, a journalist and author of The Great Reformer, a biography of Pope Francis; Dr. Massimo Borghesi, professor of Moral Philosophy at the University of Perugia (Italy) and the author of the internationally renowned biography of Pope Francis titled Jorg e Mario Bergoglio: Una biografia intellettuale; Dr. Susan Wood, SCL, professor and chair of the Department of Theology at Marquette University; Bishop Robert Barron (via video), auxiliary bishop of the Archdiocese of Los Angeles and the founder of Word on Fire Catholic Ministries; Fr. Stephen Bevans, SVD, Louis J. Luzbetak, SVD Professor of Mission and Culture, Emeritus, Catholic Theological Union; Dr. Rocco Buttiglione, a member of the Pontifical Academy of Social Sciences who holds the St. John Paul II Chair of Philosophy and History of European Institutions at the Lateran University in Rome; Dr. Guzmán Carriquiry, Vice President of the Pontifical Commission for Latin America; Dr. Peter Casarella, associate professor of theology at the University of Notre Dame; and Dr. Rodrigo Guerra Lopez, founder and researcher at the Center for Advanced Social Research, Mexico. “The joy of evangelizing, the joy of the family. The joy of the Church, the joy of creation. Joy runs through the titles of all of his documents… It’s clear that he [Pope Francis] is trying to tell us something. The joy that comes from trusting God to guide us through the storm of our tribulation, the sweet joy of evangelizing a world in flux,” said Dr.Ivereigh in his closing comments. Click here to read his opening presentation on the Vatican Insider website. “To understand the Pope’s perspective, you have to have a missionary outlook,” said Dr. Borghesi. “A Church that doesn’t live and understand the mission as part of the Spirit doesn’t understand Pope Francis. The pope’s outlook is to encounter, to meet everyone, to communicate Christ to them. Archbishop Jerome Listecki of the Archdiocese of Milwaukee welcomed symposium participants for a Mass and reception at the Cathedral of St. John the Evangelist in downtown Milwaukee on October 10. Concelebrants included Bishop Jeffrey R. Haines and Bishop James T. Schuerman, auxiliary bishops of Milwaukee, as well as Archbishop Christophe Pierre, and several Dehonian priests. Bishop Haines also sat in on several sessions at the symposium. Read more on the US Province website. The US Province Facebook page also includes several quotes and photos from the week. Materials from the symposium, both written and video, are currently being assembled by SHSST for later distribution. The SHSST Facebook page includes a video of the final panel discussion. The most recent print edition of the North American Personnel Directory is being mailed this week. All SCJs in the US Province and Canadian Region will receive a copy, as well as Dehonian candidates and novices. If yours doesn’t show up in your mailbox, please contact Nancy Grzesiak the Provincial Offices. Questions, updates or corrections for the directory? Please contact Mary Gorski. A PDF of the directory is available for download at the top of the online personnel directory webpage in the Members’ section of the US Province website. There is both a high-res and low-res version. The low-res (about 1 MG) is appropriate for use on a mobile device. You can store the PDF in iBooks, Kindle or other apps for quick access. The PDF search functions work with the document. The online directory contains the most up-to-date contact listings. Periodically, the PDF of the print version will be updated. A publish date will appear next to the PDF download. A reminder: the online personnel directory (phone book) is password-protected. For assistance in accessing the page, please contact Mary Gorski. Next Sunday, October 21, the US Province is among a group of sponsors hosting a benefit concert for Milwaukee area DACA recipients (Deferred Action for Childhood Arrivals). The program will take place from 2:00-4:00 p.m. in the St. Joseph Chapel of the School Sisters of St. Francis Motherhouse, 1501 S. Layton Blvd., Milwaukee (free parking is at 29th and Orchard). Proceeds will go to assist “Dreamers” with the $500 DACA renewal fee. Tickets are $20 and available through Mark Peters, province JPR director. Native Hope Media recently put together a video of the 42nd annual St. Joseph’s Indian School Powwow. It took place September 15. Click here or on the image above to view it. On Thursday, October 18, Native Hope will become the first recipient of the annual Johnny Klingler, SCJ, Social Action Award. Representatives of the Province Justice, Peace and Reconciliation Commission will present the award during this week’s board meeting at St. Joseph’s Indian School. The award was created to honor Fr. Johnny Klingler for his decades of commitment to social justice, and to recognize individuals or groups who exemplify the Dehonian charism of dedication to “ministry to the lowly and the humble, the workers and the poor” (Rule of Life #31). Native Hope’s mission is to bring healing and hope to Native people through storytelling. St. Joseph’s Indian School, an apostolate of the Priests of the Sacred Heart (Dehonians) is a founding partner. The JPR Commission invites SCJs to nominate a person or organization for next year’s award. Click here for more information. Br. 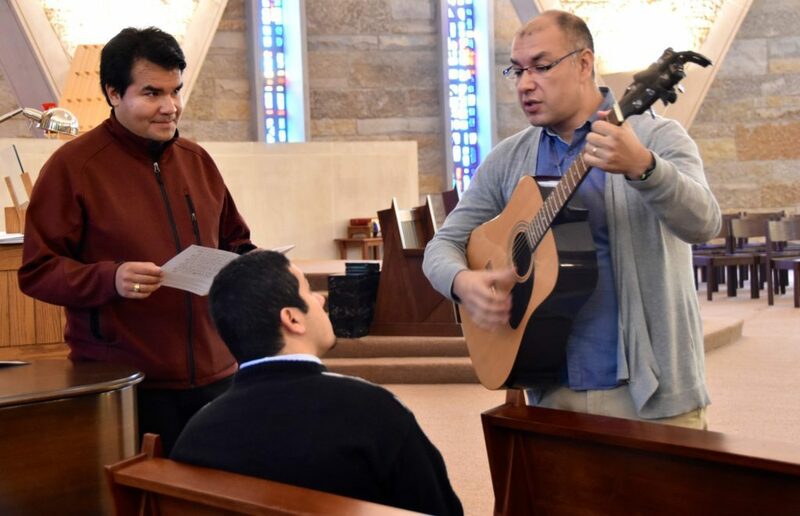 Diego (right) helps prepare music for a recent SHSST liturgy. Novice Angel Romero is pictured left. The transfer of Br. Diego Diaz, SCJ, from the Argentine to the US Province was approved by Fr. General and his council on October 12. Br. Diego has been in the ESL program during the past year; his first assignment will be with the Mississippi community as of January 1, 2019. Welcome! Fr. Mark Fortner, SCJ, left yesterday for a visit to Indonesia where he served as a missionary for many years. During his visit he will celebrate his 50th anniversary of ordination at St. Stephen’s parish in Jakarta, a parish that he helped to establish. He will also celebrate his jubilee in Palembang on November 10; joining him will be Fr. Aegidius Warsito and Fr. Yohanes Yuliwan Maslim, Indonesian SCJs of the Canadian Region, who celebrate their 25th anniversaries of ordination this year. 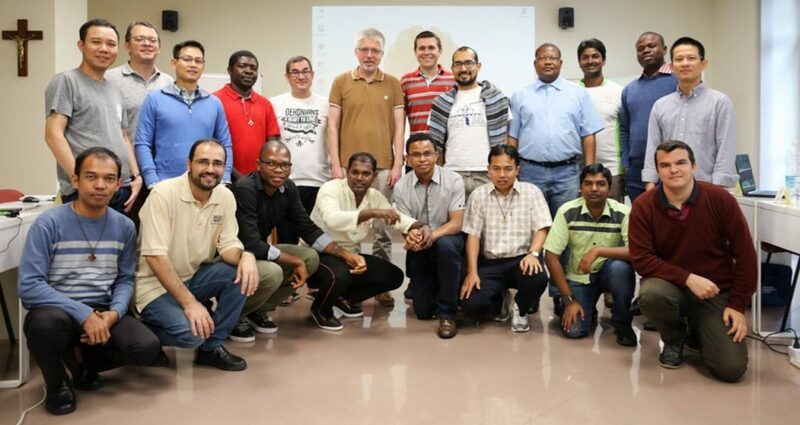 The fourth edition of the congregation’s extended formation program for SCJs preparing for or already taking part in formation ministry is underway in Rome. Among the participants is Fr. Joseph-Thien Dinh, SCJ, of the US Province. The course is under the direction of Fr. Zeferino Policarpo, SCJ, of the Portuguese Province. Instructors include Dehonians and other lecturers. During the second semester, participants will take part in a course at the Salesian University in Rome. The program will conclude with a pilgrimage to the Holy Land scheduled for July, 2019. Click here to read more about the formation course. On October 11, the members of the Canadian Region gathered with former parishioners and friends to honor Fr. Walter Van As, SCJ, who died on October 6. Fr. 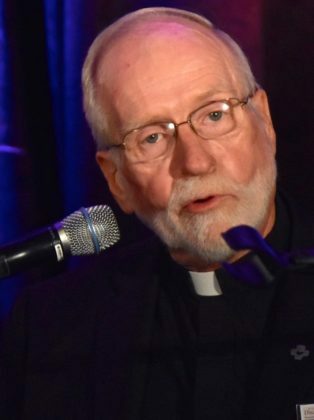 Claude Bédard, SCJ, was the homilist; Fr. John van den Hengel, SCJ, regional superior, was the presider. Concelebrants included Bishop Pierre Morissette, bishop of Saint Jérôme. 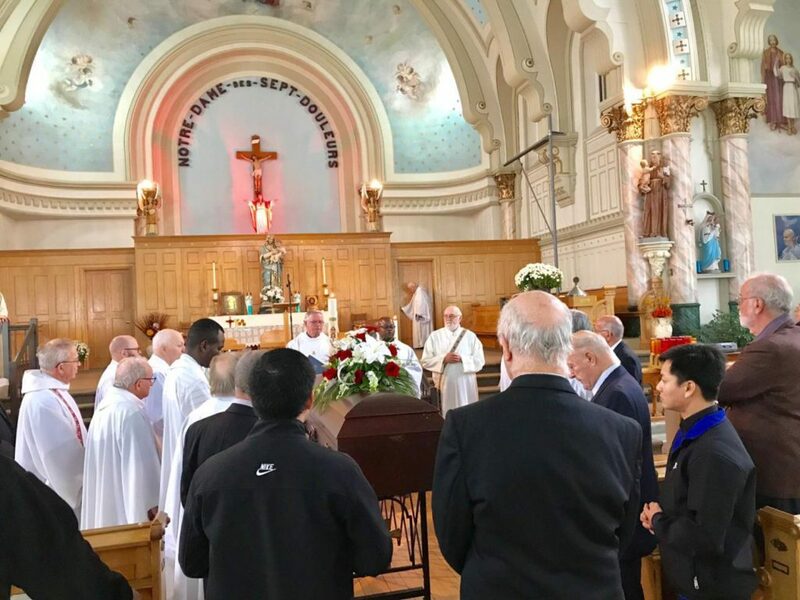 The Funeral Mass took place at Notre Dame du Sept-Douleurs in Grenville, QC. Photos and a brief write-up about Fr. Walter are on DehonCanada, the regional blog. The second summer session of Sacred Heart Seminary and School of Theology‘s ESL program recently ended and several of our international students are heading home. Fr. 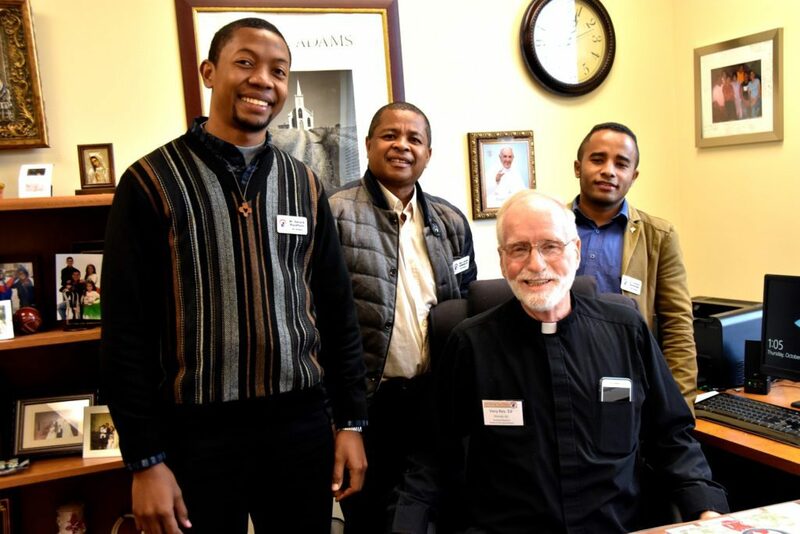 Ed Kilianski is pictured here with three Dehonian students from Madagascar: Frater Haja Gérard Éric Razafison, Fr. Justin Razafindrakoto and Frater Ferdinand Rasoloarimanana. Before leaving last week, the students visited with Fr. Ed and gave him a banner noting some of the ministries of the country.